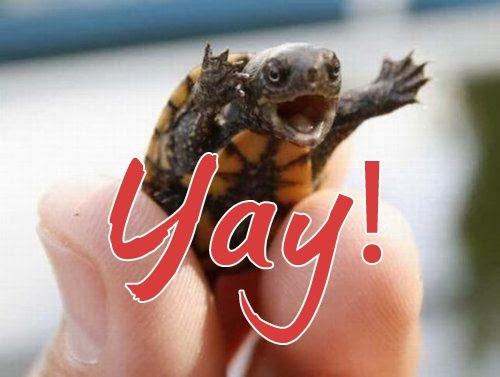 This calls for a yay turtle! Anyways, today’s visit went great! He said that I looked “noticeably thinner.” I’d lost another 4 pounds since my weigh-in with the trainer a few weeks back. He asked about my medication and I relayed with much enthusiasm how much I am loving my new migraine medicine, and that I hadn’t had a migraine since February. We talked about my weight loss goals and my current diet. He agreed with my dietician that I’d been a little hard on myself, and that as long as I don’t fall back into my old eating habits, that I will continue to lose weight and be just fine. My doctor recommended I get a pneumonia vaccine, so I got that this visit as well. I have reviewed your lab results and everything looks great. your cholesterol is excellent and you have gone back to the pre-diabetes range for your hemoglobin A1c. Keep up the great work! Seriously seriously SERIOUSLY good news! I’m so stoked right now. My A1C is currently 6.3%. I’d like to get it lower, but that’s a really good start.